Hello Dealsnloot Readers,Online communication has become an integral part of the life of every person, one way or another. Some use specialized forums devoted, for example, to bicycles, computers, or trips abroad, while others hang out on social networks, chatting with friends and acquaintances. There are many types of social networks where you not only text each other but also share videos, photos, and music. And there are dating sites which are very popular now. Various categories of users come to dating sites, and they want to find an interesting person to talk to, get to know each other better, or even find a soul mate. It happened so that, in our time, many get to know each other through the Internet, and there is nothing wrong with that. Often, these acquaintances can reach a serious relationship and a long life together. Time moves forward, and if you use all the modern tools and technologies wisely, you can benefit from them. If you are thinking about creating a dating site, you definitely need a first-class solution. A dating site must be safe, have all the necessary functionality, and, of course, attract the attention of users with high-quality design. In addition, the progress in the IT industry dictates its own requirements, and any site now is simply obliged to work correctly on any devices, be it a desktop computer or a smartphone. 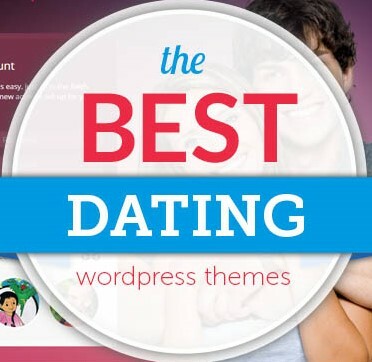 We suggest choosing WordPress and its dating site templates. Be sure to check out Casanova for all of your dating needs! Firstly, WordPress is very easy to use as a platform for your site. To create a site on WordPress, you don't need to be a developer. Everything is done through the control panel and page builder with a convenient drag-and-drop interface. Secondly, by choosing the WordPress dating site template, you get several ready-made versions of the site pages with responsive design. They can be further customized to your liking, and you can spend a lot of time which could be saved for promotion and advertising. Of course, you can find the WordPress dating site template for free, but free dating site templates are usually created in haste by non-professionals. Their developers rarely check them for compatibility. Sweet Date is more than just a WordPress dating site template. This is a turnkey solution with a clean, modern design that is suitable for a site of any type. But all its functions were originally adapted specifically for dating sites. Together with the template, you get more than 40 ready-made pages for registration, account activation, forum, participants, blog, contact information, "About us" page, search engine, and so on. As for the design of the site, there are three main color schemes. You can also create your own pages using the available short codes. 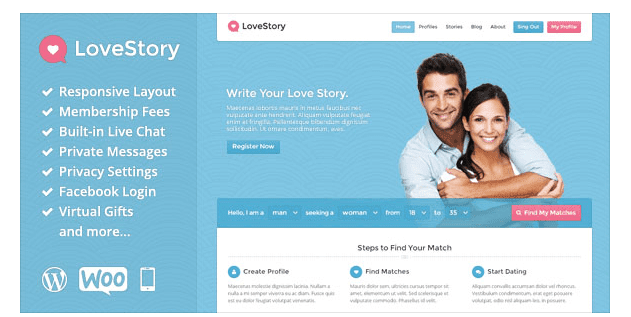 LoveStory is the perfect template for any community or social network site, including a dating service. With it, you can create a great website with many built-in functions, including a paid subscription, virtual gifts, and messages. In the control panel, you can configure any site parameters, both design-related and functional. You can add a slider to the home page. Each user will have a cool profile in which he/she can add photos and information about him/herself. In it, he/she will also be able to view selected users, view gifts, and read messages from other users. You can also customize your privacy settings. Messages support real-time notification function. This means that your users will be able to quickly and easily communicate with each other no matter what page of the site they are on. For users’ convenience and safety, there is a message filter. That's all the WordPress templates for a dating site that we wanted to tell you about in this review. We are sure that you will be able to choose the best dating site template for yourself and create a high-quality website.